I woke up this morning excited to go on a hike with new friends. It was snowing a little bit, but as usual for Victoria nothing was laying on the ground. I didn’t even have to use a scraper on my windshield. We drove thirty minutes out of town to the Sooke Hills and the landscape started changing quickly. Snow snow snow! Drooping branches heavy under the weight of the snow. I originally thought about taking everyone to Braden, which is a longer hike with rocky, steep sections and little tree cover. Once I saw how much snow there was, I realized we’d have to stick to the forest (where the trees kept the ground mostly clear of snow) if we were going to get anywhere with our current equipment. I decided to take us to Sugarloaf, which is a mostly protected hike except for the last twenty minutes or so. 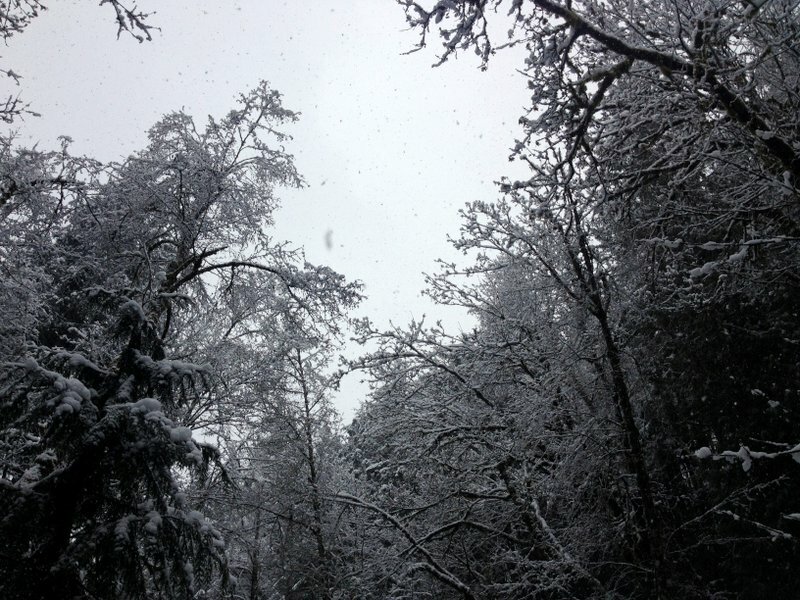 Up around 400m elevation, the trees are much sparser and the snow was a little less than a foot deep. Almost same spot as the picture above, but after we walked through it. It made path finding a bit slow, but luckily I had done this hike so many times we only lost the way a few times! Summit of Sugarloaf, facing the Olympic Mountains and the Strait of Juan de Fuca. Getting to the summit was a real treat. One of us made a snow angel. Gluten free cookies were eaten. And the we started back down as quickly as possible, as it the wind was freezing cold up there. The beautiful summit tree and Penny. Just for fun, I am sharing this photo of the Sugarloaf summit during a hike in May 2012. It was taken in almost the same spot as the photo above. This is how Sugarloaf looks just about every other day of the year, no matter what season.